Something that has become a super popular well-being trend recently, is colouring in for grown ups. I have been on this bandwagon for quite some time, and I can honestly say it helps me immensely! Why have so many adults decided to re-discover their colouring books? Well, in my case, I have found it to be a great distraction when anxiety hits; plus, I've always loved doing anything creative and artsy. Some psychologists have said that colouring has become such a popular form of therapy, because it coincides with the practice of mindfulness. The simplest way to describe mindfulness, is that it's the practice of staying in the moment; of not letting our anxious minds take us on a roller coaster ride, only causing us even more anxiety. Anyone who suffers with anxiety will tell you, it is no easy feat to achieve any kind of calm. So of course, any activity or hobby that helps to achieve this mindful state, is always going to be helpful in relieving anxiety and stress. Another theory, is that colouring brings back fond memories of childhood, and in doing so it can give us a sense of calm or having "not a care in the world", like we did when we were children. It can create a feeling of security and make us feel all warm and fuzzy inside. So it makes sense, right? Colouring is easy, it's creative, and it's a distraction. Even if you don't suffer with anxiety, or don't feel particularly stressed, we all still need a distraction at times. Since this has become such a trend, there are so many beautiful colouring books on the market nowadays, designed specifically for adults. So no more colouring in Barbie or My Little Pony for me - I've moved on to the big kids books! 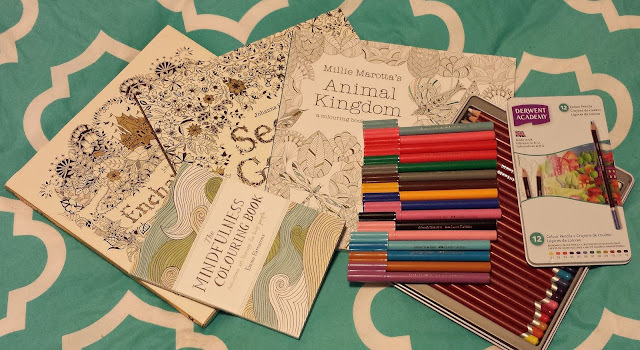 My little collection of colouring books. I purchased three of these from Booktopia, and I find their prices to be really reasonable on not only these, but on most books. I love these books SO much! Colouring might not be everyone's cup of tea, but if you have an artistic flare, and are on the lookout for something lovely and relaxing to do, I would absolutely recommend starting your own little collection of these beautiful books! Disclaimer: This is not a sponsored post. Any mention of products or companies, is solely based on my own experience and opinion. I have not been paid to mention Booktopia or any of the books shown in this post.